When the last strains of Prokofiev's score faded away, I felt sorry for Cinderella’s selfish, cruel stepmother. How could she ever measure up to the faded memories of a dead wife who was seemingly so perfect that she’d transformed into a glittering fairy? Pacific Northwest Ballet’s new production of Jean Christophe Maillot’s “Cendrillon” is by no means the sticky-sweet version of "Cinderella" that most Americans know from Walt Disney’s 1950 cartoon. As PNB Artistic Director Peter Boal writes in the “Cendrillon” program, Maillot has no room for bibbidy bobbidy boo and enchanted mice. Those of you familiar with Maillot’s “Romeo et Juliette,” which PNB premiered in 2008, know the choreographer creates seamless ballet stories, with the emphasis on dramatic momentum. Cendrillon” may not have the heft of Shakespeare’s tragic love story, but Maillot has crafted a nuanced, much darker, and ultimately more enjoyable version of the tale of the orphaned girl and her prince. The “Cinderella/Cendrillon” fairy tale presents audiences with the archetypal blended family: a bereaved man discovers a second chance at love with a beautiful woman. She has no room in her heart for his daughter, and her own two girls ruthlessly mock and torment their new stepsister. Can you say dysfunction? In Maillot’s version, Cendrillon craves any scrap of affection that comes her way; her heart opens again and again, despite the abuse that comes her way. No wonder she leaps to embrace the gilded Fairy who enters her wretched existence, offering an invitation to the ball, and a cleverly presented preview of the happiness that awaits the girl when she meets her Prince. Maillot’s Prince is not charming, at least not at first. He strides onstage, resplendent in a shiny gold doublet, trailed by four friends who alternately amuse and fawn over him. He's restless, virtually screaming "is that all there is, my friends?" "Cendrillon" is tinged with melancholy, but Maillot also infuses it with humor: the stepmother’s purple gown features a scorpion tail that looks a bit like Barney the cartoon dinosaur; her daughters’ party wigs look like upside-down pastry horns. Their party finery is presented to them by a pair of fops who Maillot dubs the Pleasure Superintendents. They simper and fuss, fluttering across the stage, but at times they seem robotic as well, their arms and legs bending into right angles at the joints. These superintendents keep the story in motion, herding the characters from scene to scene. While story prevails in “Cendrillon,” the dancing is intriguing and often exquisite. Principal dancer Noelani Pantastico danced the role during her years with Maillot’s own company, Les Ballets de Monte-Carlo, and she infuses the character with a tender yearning. From the ballet's prologue to her happy ending, Pantastico dances in bare feet. You can't take your eyes off of them as they are stomped on by her step sisters, dipped in glitter by the Fairy, and ultimately worshiped by the Prince. On opening night James Moore was a feisty, passionate prince, rejecting the beauties who paraded before him, only to succumb to Pantastico’s simple allure. For her, he tosses aside his gold jacket, revealing the pure heart he’d hidden away beneath it. Corps de ballet members Miles Pertl and Steven Loch excelled as the Pleasure Superindents; in fact, they seemed to revel in their silliness, as did the most excellent Step Sisters, Rachel Foster and Sarah Ricard Orza. Rausch’s Stepmother is indeed a selfish woman, but in Maillot’s ballet, she is also pitiable. When it becomes clear that she will never measure up to the memory of her predecessor, and she is ultimately spurned, Rausch stands flat footed, center stage, gazing out at the audience. Every trace of imperiousness is gone, and we recognize the profundity of her loss is equal to that of her husband. Cinderella and the Prince might live happily ever after, but there is no joy ahead for their elders. 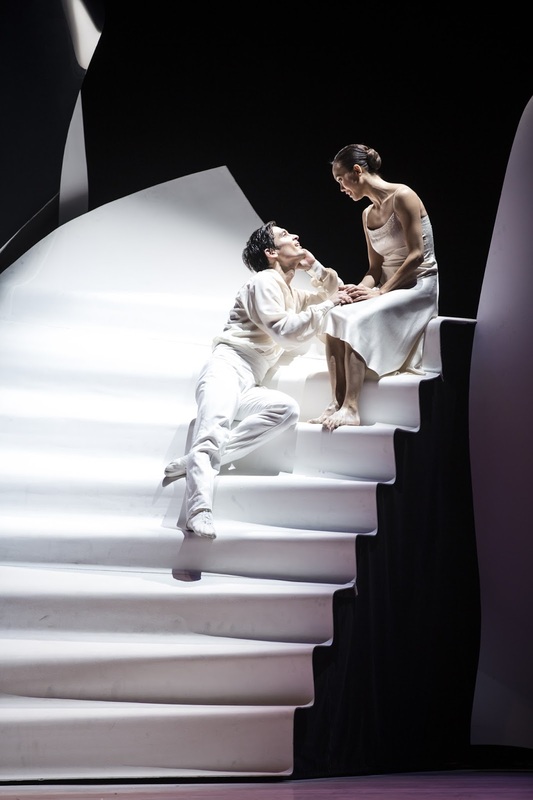 "Cendrillon" may not offer the heft and emotional roller coaster of Maillot’s “Romeo et Juliette,” but this lush, complex performance is worth repeated viewings. PNB’s “Cendrillon” continues through February 12 at McCaw Hall, with several dancers rotating in the main roles. Perfect, Marcie. You captured the essence of this version and gave the major dancers the excellent reviews they all deserved.